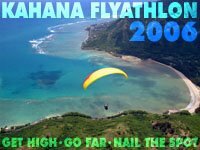 Fill those coolers, stuff those glider bags and make your way to Kahana Bay this Sunday, August 20th, for the 2006 Kahana Flyathlon (rhymes with Triathlon). The games start at 10:00am and admission is free, Wow! Bring the wife, kids, friends and family and celebrate a day of all things flying. Don't forget the sunscreen, chairs, coolers, snacks and sense of humor. 2) Downwind XC Race: Distance or declared goal (11am or so). 3) Spot Landing (with optional Bomb Drop). We will make updates on day or location as needed here. Comments or assistance can be sent to Alex (223-0144) or Dave (382-0568), or posted here or on the chatterbox. we have left overs from the meeting. Thanks for all the contributions! I'll bring the grill and the meat! I really like the idea of a triathlon format. How about this: starting at the beach at Kahana, we'll hike up and fly to the beach park in Hauula, where we'll hop on a mountain bike to traverse one of the Hauula loop trails, returning to the Hauula beach park to launch a kayak bound for the beach at Kahana. On the other hand, that sounds like way too much work. Nice logo Alex. Someone ( not me) should make a t-shirt. The weather from this far out is looking promising for a Kahana Sunday.